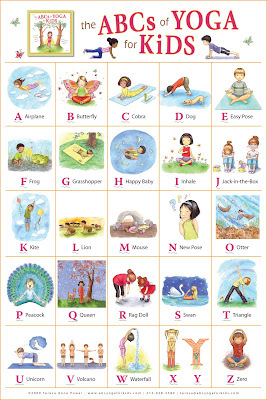 Because of the success of the book "The ABCs of Yoga for Kids", this accompanying poster is being released. I believe it will be sold through the official website, as well as Amazon.com. It is meant to be used as a fun poster for kids to hang on their walls, as well as an instructional tool for yoga studios. Watch for more info on an upcoming "The ABCs of Yoga for Kids" coloring book as well. Hi Kathleen! I bought the book and it is FAB and now a poster? Woo-hoo love it! I remember when you were buried with your two book projects and feeling overwhelmed. Look at the results!! This is fantastic! Please post it on the PB site as well, so everyone can congratulate you. What a wonderful addition to the book. All the best for continued success! Congratulation on your success, Kate! All kindergartens should have this poster hang on their wall! Oh, that is adorable! Beautiful work. This is brilliant, Kate! I think every children's physical education program should have this in their classroom as well as for kids to have on their bedroom doors so they can do yoga daily! Great marketing tool, too! Just wonderful Kate! It's so perfect. Congratulations! wow! how fabulous for everyone! Oh wow! That is really good! Hey you, don't be shy! Share your thoughts! I'm a freelance artist and art teacher.